The UN Panel of Experts Established Pursuant to Resolution 1874 has been monitoring and reporting on violations of the North Korea sanctions regime since 2009, providing North Korea specialists with rare and valuable insight into the country’s illicit activities and sanctions evasion practices. The Panel’s reports have become more detailed over time, and they now substantiate the state of North Korea sanctions implementation using a wide variety of sources and methods. As the findings enter into the public domain, they shine an increasingly bright light on gaps in attention to and enforcement of this sanctions regime. In the decade since the UN Security Council introduced its first sanctions on North Korea, Member States have had ample time to grasp the DPRK’s threats and evasive practices, and the obligations that other countries face as a consequence. Still, a number of capitals continue to demonstrate that their internal processes are wholly inadequate to detect, report and address illicit North Korean behavior. Examines newly opened cases, including probes tied to Namibia and Vietnam. The report offers a noteworthy reminder that blindness to prohibited North Korean activity persists and continues to undermine the sanctions regime. Such blindness comes in multiple forms: naïve and negligent, willful and obstructive, and many shades in between. A number of examples leap from the pages of the report. The Panel’s correspondence with foreign capitals shows that some are in disbelief that contracting to North Korea for defense facility construction could involve sanctioned entities (Namibia), others fail to show basic vigilance on high-risk North Korean diplomats (Pakistan and the UAE) and yet others consciously choose not to investigate possible prohibited activities (Russia). With the UN sanctions regime’s newfound complexity, it is more important than ever to address these shortcomings. The newly-opened Namibia case is a particularly striking example of the extent to which the sanctions regime remains plagued by deficiencies in implementation by Member States and other key actors. Beginning around 2000, Windhoek awarded an extraordinary number of contracts to North Korea’s primary construction firm, Mansudae Overseas. 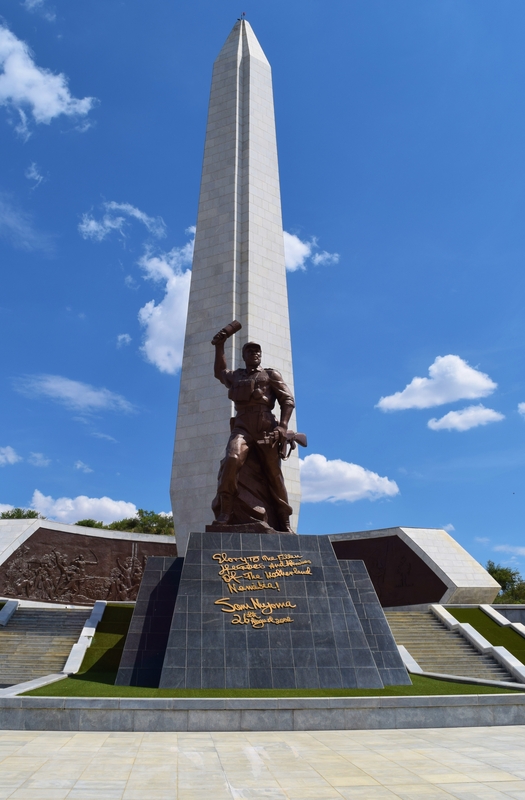 The first of these deals on record enabled the construction of the Heroes Acre monument on the outskirts of the Namibian capital; the socialist-style site was completed in 2002 but now sits largely unvisited, except by troops of baboons. In the years since that early project, the Namibian government has awarded to North Korea contracts to erect a munitions factory, the State House, an independence museum, a military museum, the Ministry of Defense headquarters and two military bases. Mansudae’s ongoing involvement in the construction of new Namibian military bases is noteworthy, not least because such bases could fall within the definition of prohibited services relating to the “provision, manufacture, [or] maintenance . . . of arms and related materiel.” Furthermore, the Panel noted evidence that the Korea Mining Development Trading Corporation (KOMID), a designated entity, has been involved in some of the aforementioned military-related projects, either working with Mansudae or using it as a front. In 2015, the US Department of Treasury designated KOMID representatives based in Namibia, implying agreement with the Panel’s assessment. Windhoek responded to the allegations by claiming it had “no idea” that KOMID and Mansudae might be linked or collectively involved, and that it had no evidence that the Namibian-North Korean relationship crossed into sanctions territory. While this assertion should be taken with a large grain of salt, it puts Namibia somewhere on the spectrum between naiveté and disingenuous cooperation. Awarding defense contracts allegedly valued at N$ 5 billion (US$ 335 million) to a North Korean company and assuming that North Korea’s primary military contractor overseas (KOMID) would not be involved is, at a minimum, enormously ignorant. Though not directly bound by UN Security Council resolutions, the financial institutions supporting the activities of Mansudae Overseas in Namibia also deserve mention. Documents published by the Panel reveal that the company banked with First National Bank and was insured by Old Mutual—two reputable South African financial institutions. Assuming that financing defense contracts with North Korea is not within their risk appetite, these South African institutions appear either to have not known that their client was North Korean-owned—a cardinal “Know Your Customer” sin—or to have not made the effort to understand that much of Mansudae’s business in Namibia was military-related and potentially subject to sanctions. Either would be difficult to excuse. The Panel’s analysis of recent travel by KOMID representatives is equally telling. KOMID representatives based in Russia and Namibia transited Islamabad and Karachi at least 28 times between December 2012 and October 2015, frequently traveling together with consecutively numbered tickets issued by a travel agency. They would enter Pakistan at one airport and depart from a separate one. It is disappointing to think that Islamabad expected sanctions enforcement to be that simple. Yet simple diligence measures by staff at the Pakistani Embassy in Tehran would have sent up numerous red flags. For example, a Google search for the name of the Russia-based KOMID representative turns up his bio at the DPRK Embassy in Moscow and a description of the relevant US sanctions in the first five results. In a similar case, the United Arab Emirates provided information about visits by another KOMID representative, whom UAE authorities said they considered a “businessman” as well as the Third Secretary at the DPRK Embassy in Tehran. The individual traveled to the UAE 16 times between April 2013 and October 2014, on each occasion entering the country on a flight from Tehran, leaving the airport and then exiting the country on the same day. In many cases, he returned directly to Tehran. Towards the end of this period, his visits took place approximately every two weeks. Furthermore, despite his purported background as a “businessman” and an “official,” the listed purpose of his visit was always “tourism” and his visas were sponsored by travel agencies, including the Emirates Airlines-owned Arabian Adventures. UN Security Council resolutions passed in 2013 drew Member States’ attention to the fact that North Korean diplomats are frequently engaged in illicit activities, including business for designated entities. As a result, they urged Member States to exert vigilance over the activities and movements of North Korean diplomats. Since then, countries around the world have had good reason to monitor North Korean diplomats transiting their territory. Frequent North Korean visitors based in Tehran certainly meet the definition of “high-risk” in the context of sanctions enforcement, and they should be candidates for immediate attention from national authorities. Judging by the content of your letter, the Panel has not conducted an independent research of activities of the two North Korean citizens that we were requested to provide information about. Unilateral sanctions that were imposed by the USA and France against those individuals for the reasons that we are unaware of, do not serve for us as an argument for suspicion of their unlawful activity on Russia’s territory. We are invariably ready to cooperate with the Panel when it . . . has substantial evidence. In short, Russia appears unprepared to cooperate on sanctions investigations and enforcement when the potential indications of a sanctions breach come from open sources. It is also not prepared to cooperate when those suspicions have been formed on the basis of intelligence assessments of other Member States. This creates a chicken-and-egg scenario for the Panel’s Russia-related investigations. Russia does not wish to provide its own information unless the evidence is clearer that a sanctions breach may have occurred. Yet in many cases, without Russian cooperation, the basis for such suspicion cannot be pursued. Russia’s purported blindness to possible North Korean illicit activities facilitated on its territory is clearly willful. As with naïve and negligent forms of blindness, the Panel report shows that relevant private-sector actors also can be willfully ignorant of possible North Korean illicit activity. The Chinpo Shipping case in Singapore, discussed previously on 38 North and treated in the Panel’s latest report, illustrates this point. The court documents from the case clearly revealed that Bank of China instructed the Singaporean company, which provided ship handling services exclusively for vessels trading with North Korea, to remove any mention of North Korea or the names of its vessels from the payment instructions. The court documents indicated that Bank of China did not want the payments to be held up by robust due diligence procedures at its correspondent banks, or to have evidence that a transaction was North Korea-linked. In illuminating the inadequacies of the procedures that countries and relevant private sector organizations have put in place to counter illicit North Korean activity, or indeed the absence of such procedures, the Panel’s 2016 report sends a sobering message: despite a decade of sanctions, the nonproliferation community still has an immense amount of work to do. Awareness of the deceptive and evasive practices used by North Korea and its associates must be raised substantially. In addition, information on these tactics must be regularly updated and repeatedly disseminated when North Korea inevitably begins to adapt to the new or modified restrictions adopted by the UN and its individual Member States. Implementation assistance, whether practical or legal, is also necessary. Yet while these efforts can help the naïve and deficient, they will not affect the willfully blind. UN Security Council Resolution 2270 strives to, amongst other things, reduce the number of North Korean “safe havens”—locations where the country’s illicit networks can operate unhindered because of the ignorance of or cover from the host government. As part of that effort, the global nonproliferation community should continue to draw attention to actors who maintain an unacceptable “ignorance is bliss” policy. Their inaction, like those of the benignly negligent, offers North Korea unscrutinized sources of revenue, as in Namibia. It keeps open pathways for North Korea to move people, goods and funds unhindered, as in Pakistan and the UAE. And it leaves North Korea with unchecked territory on which to locate representatives of designated entities, or from which to facilitate prohibited activities, as in Russia. Each of these shortcomings undermines the sanctions regime as a whole and must be addressed. Author’s visit to Windhoek, January 2016. United Nations, Security Council. Resolution 1874 (2009) [Non-proliferation/Democratic People’s Republic of Korea] S/RES/1874 (12 June 2009), http://www.undocs.org/S/RES/1874(2009). United Nations, Security Council, Report of the UN Panel of Experts Established Pursuant to Resolution 1874, S/2016/157 (24 February 2016), 40-41, http://www.undocs.org/S/2016/157. US Department of the Treasury, “Treasury Imposes Sanctions Against the Government of the Democratic People’s Republic of Korea,” January 2, 2015, https://www.treasury.gov/press-center/press-releases/Pages/jl9733.aspx. “Namibia defends munitions project by North Korea,” The Star, March 14, 2016, http://en.starafrica.com/news/namibia-defends-munitions-project-by-north-korea.html. The information provided by the UAE left numerous return trip destinations blank. 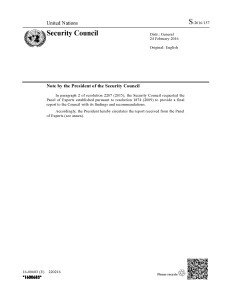 United Nations, Security Council, Report of the Panel of Experts Established Pursuant to Resolution 1874, S/2015/131 (23 February 2015), 240-241, http://www.undocs.org/S/2015/131.